Another rather excellent photograph has been uncovered within the London Irish Rifles’ museum archives. 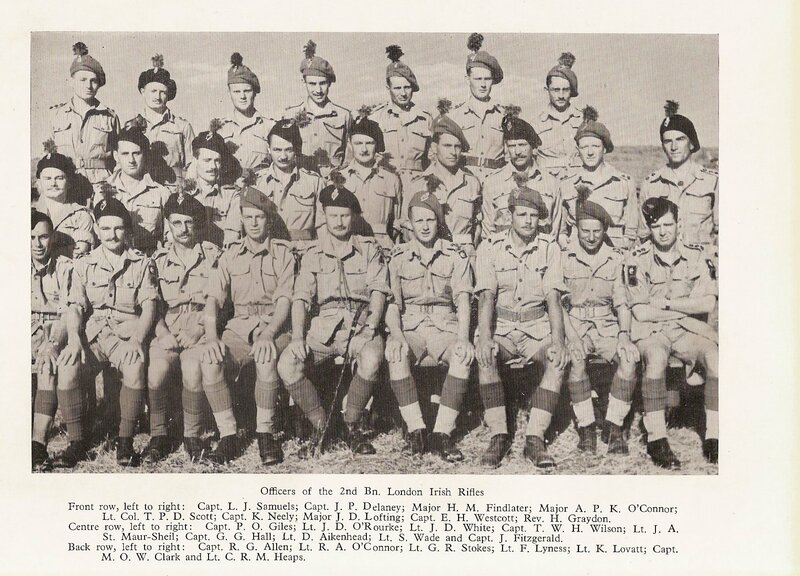 This one shows the officers of the 2nd Battalion, under the command of Lt Colonel (later Brigadier) Pat Scott, when they were resting at Guelma, Algeria in June 1943. A number of familiar names and legendary reputations. It should also be noted that the battalion’s Second in Command, Major APK (Kevin) O’Connor was later killed during October 1943 at the River Trigno in Italy. “The officers are wearing a mixture of rifle-green and drab (khaki) caubeens, as well as St Patrick’s blue and green hackles. All the pipers would have worn caubeens, but 2 LIR was the sole battalion in which everyone wore them. The ‘Skins’ adopted them after their 2nd Bn made their own in the Anzio beachhead and the Faughs then followed.